Former UM president C. D. (Dan) Mote, Jr., a professor of mechanical engineering at the Clark School, has been named a University System of Maryland Regents Professor. Regents Professors are recognized for scholarly achievements and exceptional service to the system and to their respective institutions. 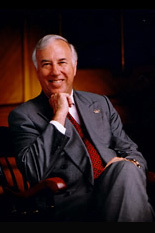 Mote served as president of UM from September 1998 to August 2010. He spurred the university to lead the state in the development of its high-tech economy, especially in the information and communication, bioscience and biotechnology, and nano-technology sectors. Mote greatly expanded the university's partnerships with corporate and federal laboratories and successfully negotiated to bring to the College Park area the first Science Research Park sponsored by the People's Republic of China. He is a leader in the national dialogue on higher education and his analyses of shifting funding models have been featured in local and national media. He has testified on major educational issues before Congress, representing the University and higher education associations on the problem of visa barriers for international students and scholars and on deemed export control issues. Mote has served as vice chair of the Department of Defense Basic Research Committee, and is a member of the Council of the National Academy of Engineering (NAE). He was recently elected treasurer of the NAE. In 2004-2005, he served as president of the Atlantic Coast Conference. In 2002, Washington Business Forward magazine counted him among the top 20 most influential leaders in the region. He has produced more than 300 publications, holds patents in the U.S., Norway, Finland and Sweden, and has mentored 56 Ph.D. students.